Rotary-Type Cut With DA Safety. Looking to achieve the same level of cutting action with a dual action (DA) machine polisher as can be achieved with a rotary? FLEXIPADS DA Microfibre One Cutting Discs make it possible! Due to the dual action of spinning and oscillation, DA machine polishers are inherently safer than rotary polishers whose direct spinning action can build friction and heat quickly. However, the drawback with DA's has been the reduced ability to remove moderate to heavy blemishes, particularly on harder paint finishes. 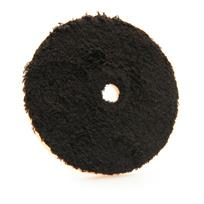 FLEXIPADS DA Microfibre One Cutting Discs are constructed from a long, soft microfibre and laminated to a supportive yet flexible polyurethane backing. This combination provides a more efficient cutting action than a traditional foam pad, yet is capable of finishing to a refined gloss in one stage.